A growing number of people want the president to stop eating meat in public. As Health Educator in Chief, many people expect President Obama to set a good example by eating healthier food in public and at the many official photo opportunities. Now let’s be clear: it’s no-one’s business what a political leader eats in his or her private life. But these are photo ops, each one carefully arranged by the White House in order to create an intentional image. And time and again, they feature exactly the food products that federally funded research has shown to cause heart disease, diabetes, obesity, cancer, and other health problems, and that health officials are encouraging us to avoid. 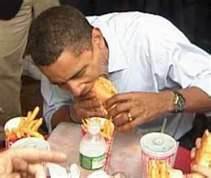 Since taking office, President Obama has posed for the cameras eating a hot dog at a basketball game with British Prime Minister David Cameron, eating cheeseburgers with Russian President Dmitry Medvedev, and stopping at a D.C. burger restaurant to share a cheeseburger with a reporter, among other similar instances. His predecessors, including Bill Clinton, George W. Bush, and Ronald Reagan have also been caught on camera eating unhealthy foods, from ice cream to a Big Mac. For better or for worse, celebrities and public officials definitely seem to have an effect on public consumption habits. For instance, widely publicized photographs of President Franklin Delano Roosevelt eating a hot dog are credited with popularizing what once used to be a widely disliked food. Now Americans consume 7 billion hot dogs between Memorial Day and Labor Day each year. But just imagine if there was a photo op of the president chowing down a Gardenburger or enjoying a Smart Dog at a baseball game! Last year we took First Lady Michelle Obama to task on setting a good example in public in our article titled A Better Burger for the First Lady. Now it’s the president’s turn. The president never lit up a cigarette during White House photo ops. It’s time now to recognize that more cancers are caused by food choices than by tobacco and to stop giving free product promotion to the meat industry. Indeed, a study published in the Journal of the National Cancer Institute revealed that diet accounts for up to twice the number of cases of cancer as does tobacco. We have also written about Why It is Important for America to change the food it eats from an even broader point of view. On the other hand, the food plate promoted by the USDA is the most veg-friendly one ever produced, and Secretary of Energy Steven Chu, who is known to have a copy of Diet for a Small Planet on his bookshelf, has commented on the benefits of a veg diet for both the environment and global hunger. As we approach the July 4th holiday we recognize the many great Americans who have championed the vegetarian message, including: founding father Benjamin Franklin; founder of the American Red Cross Clara Barton; hero of women’s suffrage Susan B. Anthony; inventor of the light bulb Thomas Edison; senior speech writer for the Bush administration, and author of the best-selling book Dominion, which advocates a veg diet, Mathew Scully; and, most recently, former president Bill Clinton. Let’s hope that President Obama and all future presidents set a better example with their public food choices.